Landmark Construction supports its local community of Loomis and the Loomis Basic Education Foundation (LBEF) is no exception. Joe Bittaker, Chairman of Landmark Construction is also an active LBEF board member so when Landmark employees were invited to participate in this years’ inaugural MandaRide, it was an easy yes. Each year LBEF hosts several fundraisers for Loomis Union School District to help provide programs such as fine arts and technology. Since its inception, LBEF has hosted a 5K and half marathon, MandaRun, in November each year. With its 10-year anniversary approaching, board members have set their sights on 100% increase in overall school contributions as well as increased specific program giving. To that end, fundraising efforts also need to be doubled. The MandaRide, a naturally complementary event in the local community, was added to the current fundraising efforts: The MandaRun, Go the Distance 24-hour relay, and the Holiday Home Tour. MandaRide led riders on a beautiful scenic ride around the Sierra Nevada Foothills on Saturday April 28th, 2018. Options for the morning’s ride included a 30-mile, 12-mile and family ride. Each ride began at Loomis Grammar School and wove through the town of Loomis. Riders returned to Loomis Grammar School for a delicious lunch. Landmark participants included Chairman Joe Bittaker and President Kevin Brennan on the 30-mile ride, Vice President Paul Hanson and his wife, Susie, Preconstruction Manager Ellen Kelton, Senior Estimator Ruben Scherle’s wife, Kalan Scherle, and Project Engineer Cameron Harrison, his wife, Giovanna Forno, and their son, Valentino on the 12-mile ride and Marketing Assistant Kirsten Goble, her daughter Vivienne and IT Support Brian Gerbi joined the 1-mile family ride. 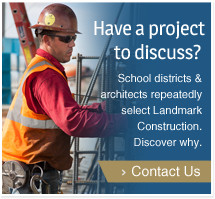 Landmark Construction supports many community education programs throughout the year. The builder also sponsors employees’ registration fees for those who participate in marathons, iron man, bicycle races, motocross, cross country off road motorcycle and other endurance races. Learn about working for an exceptional construction company that values employees who want to challenge themselves and give back to the community, by going to the Company section of the website.